I have always found alignments break down as historically they are inwardly focussed to a single society. Republican Romans were indeed very lawful within Italy, but thought nothing of slaughtering 'enemies' while conquering their countries and used fear and slavery as ruling method where ever the Republic spread. A Roman citizen could be absolutely lawful good while in Rome, respectful and kind to the poor, and then think nothing of killing or enslaving the Gauls. He wasn't putting on a false face in Rome, he honestly thought himself a good man there but he had no problem reconciling his two behaviors and the alignment system does. The difference is who he sees as 'Us', he only sees Romans, everyone else is 'Them' and the rules do not apply to them. In game terms a Paladin of Bahamut could be a saint in Fallcrest. Gives to the poor, tends to the sick, pets puppies and all that but once he steps into a goblin village would have no trouble killing everything there including the sick, the woman and children. The Romans would have no trouble seeing him as Lawful Good, but most DMs would never let this slide. We spread our 'Us' pretty wide in the modern world and the alignment system always feels bit out of step with history. Yes, I acknowledge that we play fantasy, not history, but alignments never felt quite right to me and don't get me started on alignment languages and the old alignment change rules. not into alignment at all. it tries to box aggregates of actors into static, ideal social forms (aka archetypes) and creates a weird fundamentalism of how they engage the world. Paladin's must do this, evil orc's must do that. but the best place for drama lies in contingent eruptions. actors (regardless of "species" - fantastic or otherwise) are far too improvisational and autonomous to reside "in" an alignment. i mean, based on the "Evil" described above, they could all be viewed as psychopaths. i understand that theyre not fully set in stone (most things in D&D shouldnt be) and that they act as a "quick reference" for how you might view certain actors. but thats where it should end and they shouldnt be rigid, or of major importance. I think this comes down to what alignment represents. Does it represent cosmic reality or guidelines for behavior? 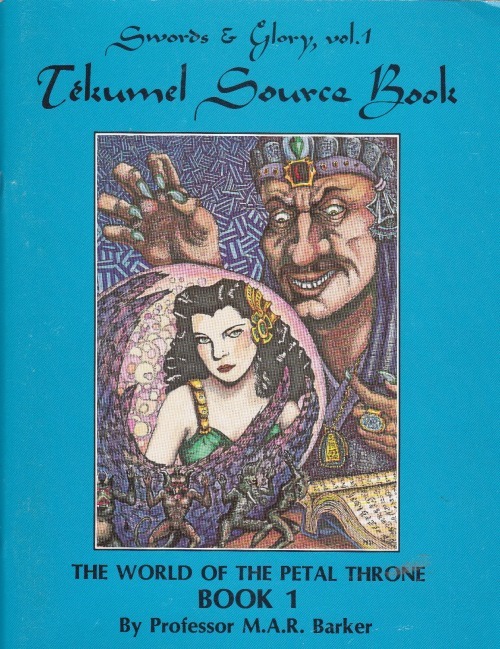 Many recent interpretations of the old law-chaos spectrum (and recent games like LotFP) favor a heuristic-based cosmic reality approach. I agree that alignment languages, when pushed to their logical extreme, seem absurd, but there are some examples in fiction that seem to work. The Black Speech of Middle Earth, for example. @Steve: I'm not clear on why "narrow and absolute" is the best option. What about it works best? @Brett: An organized invasion doesn't operate under the laws of the invaded land, it operates under the laws of the invaders. You can certainly be a Lawful culture and engage in wars of expansion, looting, and even potentially slave hunting. I know little about Roman rules of war, but I know that how Romans treated conquered lands was, for the period, enlightened. Conquered subjects were reasonably free, enjoyed the protection of the empire, enjoyed wider trade opportunities, and could earn citizenship through military service. "Good" is a harder call. I don't know squat about Roman respect for life, but my understanding is that the Romans felt they were spreading peace and civilization to the savages. Did they (as a whole) kill "wantonly or cruelly" or because they felt it was "necessary" for the greater good? By the standards of the day, I think they were relatively good. Sorry, I'm a latecomer. I don't use the nebulous alignments, I use different iterations like "Never/Sometimes/Always tortures others" or "Never/Sometimes/Always lies" (Circle one). I found about 12 of those that give a good idea of your character (and a list of which sets map to which alignments for a quick shorthand and compatibility). This is an interesting article for sure. I've found that alignments confuse and frustrate a lot of people. I wrote a piece about them that is similar to this one, but I used altruism/selfishness as the good/evil axis. 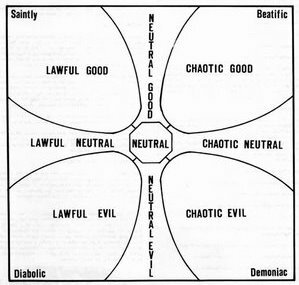 I usually claim that Alignment is the single worst idea Dave Arneson ever let loose upon the world. I still think that. I also usually claim that the problem with Alignment is that it causes Brain Damage(tm). Why do I say that? I mean that alignment seem to make educated, sensible and moral people into morons. Suddenly actions that would make sense to evaluate from a general human standpoint, or from within the culture of that character you are playing, are evaluated against this square and rigid system. It causes lawful stupid paladins to appear, and people to commit genocide because "they" are "lawful"/"chaotic"/"evil"/whatever. I'm not against the idea of moral choices in a game, but rules which delineate what can and can not be done always seen to create behaviour that are just plain stupid. Maybe the solution is to do like you did, Steve. Make sure you define the terms really narrow. But, then they kind of make the choices pointless. So, you think alignment can be interesting as a crutch of some kind when roleplaying your character? I think you need a social context instead. If you know that this one dwarf believe all life to be sacred, but he also believe himself to be most important of all, then you know how to act. Alignment is like a stick/carrot from the outside. Making real and meaningful moral choices is something that comes from within. Maybe you just like to kill things and take their stuff, and then I think you should slaughter like there is no tomorrow. Maybe you like to take hard decisions and help the weak, because it would be your idea of heroism. But, do it without a game mechanic. It just causes brain damage.